Our access control and gate scanning software can be used in a variety of locations and situations, from public entrances to restricted hospitality and corporate locations. It is targeted to volunteer attendants without previous experience - a scan takes one button push or waving a barcode in front of a stationary reader. We support a wide array of scanning formats, from real-time authorization, duplicate entry and counterfeit detection via mobile computers to unattended scanning through stationary devices. Our highest level of access control service provides counterfeit detection and real time verification of ticket and credential barcodes against a central database. Certain factors, such as non-unique ticket barcodes or choosing to eliminate credential barcodes, make this level of service unnecessary and lower-cost alternatives like hand scanners without visual feedback or unattended scanning are available. Selectively deny access to tickets and credentials due to order problems, missed work shifts or security incidents. Upon scanning, your custom message will appear against a highly visible bright red background. Use the gate scanners to deliver promotional, important or emergency messages to select tickets and credentials, without denying entry. Upon scanning, your custom message will appear against a highly visible bright yellow background. Designate scanning locations as entrances to have the count and access rules apply to overall attendance or internal sites to keep a running count and control access without impacting event attendance. View and analyze your event’s attendance in real time with four distinct reports: a daily and hourly graphical summary, a day-to-day attendance comparison tool, a detailed log of every scan and a list of all denied entries, sorted by time and reason. 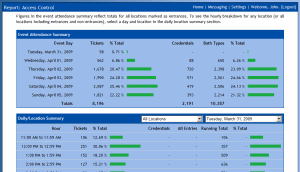 Break down reports by location or type of location. While main gate counts should always be updated in real time, secondary and smaller entrances don't need to be. Save on infrastructure by not running internet lines to secondary entrances or locate them in areas with wireless coverage. The data can be synchronized when the gates close. Alerts and denies gracefully handle security issues and last minute emergencies or notifications. 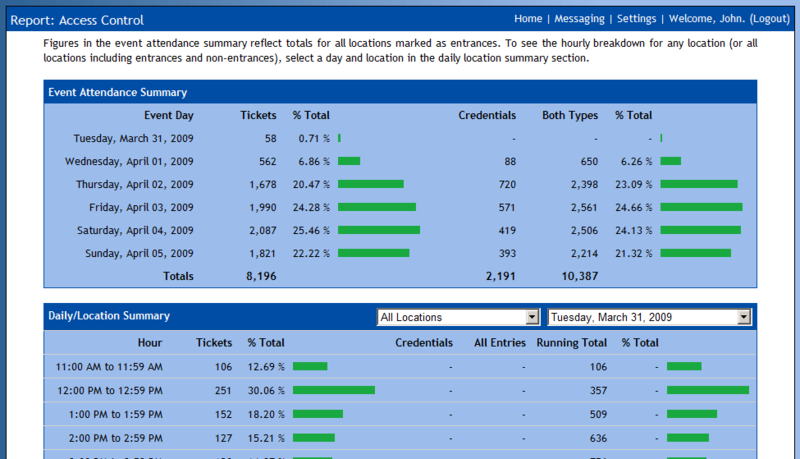 One of a variety of reports designed to help you visualize and analyze your event's attendance.